Dental implants comprise of a titanium screw which is inserted into the bone of the jaw and an artificial tooth which is then secured into the screw. The procedure can nearly always be carried out using local anaesthetic. In cases where the patient is anxious about dental treatment the procedure can be done under sedation. 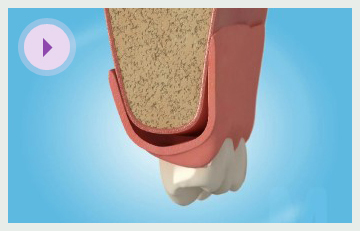 Although there have been successful cases where implants have been used to immediately to support dentures, the standard and tested method is to leave an implant for between three and six months to let bone heal around it (a process called osseo-integration), before it is used to support false teeth or crowns. Implants may be used for a variety of dental restorations. 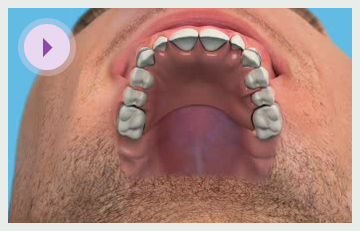 These include dentures (removable teeth), bridges (fixed teeth), and single teeth. The success rate for treatment is high (approx. 90 percent). Age is not an important factor although generally implants are not placed in adolescent patients as they are still growing and the shape of their bone may change. However lifestyle has been shown to have a large impact on the success of dental implants. Smokers have a significantly reduced chance of an implant being successful and it is vital that the patient maintains their oral hygiene as implants are susceptible to gum disease (known as peri-implantitis).